SKU: 8907043122503 Stock: Not Available Category: Lacquerware. 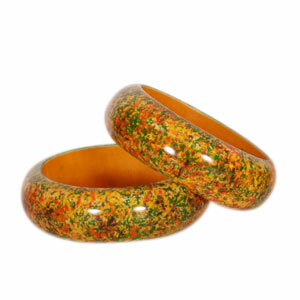 LacquerWare Bangles.Lacquerware is a traditional craft of Karnataka, largely practised by craftsmen in Channapatna. The craftsmen called ?Chitragars? turn the wood by hand or power operated lathe to form the desired shape. The wood used is hale wood which is extremely close grained, moderately hard and ideal for turning. Lacquer is applied on the wood with coloured lac sticks. Heat is generated by friction and melts the lac which helps in applying the colour uniformly. Palm leaf is then used to give it a fine finish and lustre. In recent years, craftsmen have also resorted to hand painting of some articles to attract the urban market.Lacquerware products in vibrant colours suit modern tastes and include toys, bead curtains, bangles, coasters, napkin rings and powder boxes.